Unfortunately, we do not have the opportunity to refund purchases on behalf of the organizer. You can try to sell it or give it away. To sell it safely, go to www.tikkio.com and and choose "My Purchases" then click "View Ticket" to download the ticket as PDF. You you can safely send, print and give this away to any new ticket holder. This is most likely to happen if your internet browser is not updated. Update your browser, try another browser, or purchase through our app, and you'll see that it will probably work. Please contact us for help if you can´t make it work. To find your purchases, you can log in to www.tikkio.com with your email address. Then select "My purchases". You can also download the app called "Tikkio" and select "My purchases". there. There you will see a complete list of all tickets and items you have purchased. All purchases are followed by an email to the address you are registered with including a valid QR code that can be used at when verifying tickets and purchases at the event, so search for Tikkio in your email clients. If you have more than one email address, please check if you have used one of these to register your account. Occasionally, emails from us may be put in spam / junk mail, so take a look there. If you do not find the tickets on any of your known email / user accounts, then it's likely that your purchase has not been completed. If you find that your order is being executed, but you do not receive your tickets, it is typically due to an error in either your browser's software or a communication shortage with your bank connection. Make sure your software is up to date and then try to complete the order again. In between, both of your attempts will appear on your online bank, but one posting will typically be a reservation that will be deleted again after 2-3 banking days. If, unexpectedly, you find that your card is being charged several times than intended, we will of course refund one of the purchases. Contact us at the bottom of this page. We cannot change tickets that have already been purchased. But you can contact the organizer directly and inquire if they will refund your first purchase if you buy a new ticket. The organizer can request Tikkio to assist the refund, but we cannot help without direct notice from the organizer. If you have lost your password, you can get a new one by going to tikkio.com/login/forgot and typing your email address in the field. Then follow the instructions on the screen. If you do not receive a confirmation email, check your spam filter. Also, make sure that you have entered the same email address that your account has been created with us. Too much withdrawn from your account? If it looks like that to much money are withdrawn from your account, this is usually because of a communication breach with your bank at the time of purchase. This is mostly a just a reservation on your account, and you can expect this to disappear within 2-3 banking days. Tikkio or the organizers can not control or guarantee the validity of any purchase through non-official channels and you run the risk not being granted access to the event. The name of the ticket buyer printed on a ticket usually does not have implications on who can use the ticket . Usually anyone who is in possesion of the ticket with a readable QR code can use the ticket. 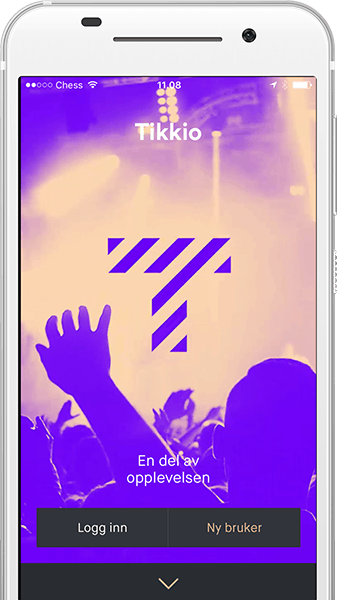 If you log on to www.tikkio.com and go to "My purchases", you can find single tickets that can be downloaded as PDF, to be printed or displayed on a smartphone. It is important that everyone uses single unique tickets to avoid problems at the entrance. I have bought several tickets and we do not arrive at the same time. What do I do? In connection with your ticket purchase, you have received an email with a PDF file. The first page of the PDF file shows your "Tikkio Wallet" QR code. When this code is scanned, all your purchased tickets can be redeemed at one time. In the same PDF file you will also find all single tickets that you have bought - they follow from page 2 onwards in the file. These single tickets allow you to distribute between different intended users of the tickets. We never recommend sharing your "Tikkio Wallet" QR code with others, but if the accident is still out, please contact us at the bottom of the page and ask us to reset the code. If you have questions about practical info, such as opening hours, day programs or the like, then you should contact the organizer directly. You will find the organizer's name under the basic information for the event in which you are interested. If you have any doubts about the rules for companions or age limits for an event, please contact the organizer directly. You find the organizer's name under the basic information for the event that you are interested in. Didn't find answers in our FAQ? 🤔 Then contact us through the form below. Tikkio is only a sales platform for tickets. If you have questions about opening hours, programs, assistance or other practical info, please contact the organizer. If you still think Tikkio is the right place for your query, you can write a message to us in the field above. Which event are you contacting us about?